Alex Bland conjures the atmosphere of wartime Britain in this nostalgic exploration of the R.A.F.’s Bomber Command, a battalion charged with the treacherous task of attacking German targets at the dead of night. Set out in a roughly chronological narrative, archive recordings and contemporary interviews with ex-crew members narrate the early stages of excitement during enlisting, followed by the eventual reality of the mission. A great strength of this film is its ability to adjust tone by changing medium. Alex Bland begins by adopting the aesthetic of wartime enrolment poster design. Using this style as a starting point he continues to masterfully employ a multitude of techniques; combining rotoscoped hand painted animation, laid over textured backgrounds and combined with elements of archive footage. CGI, 2D digital, collage and hand painted components support the diverse imagery in this accomplished animated documentary. 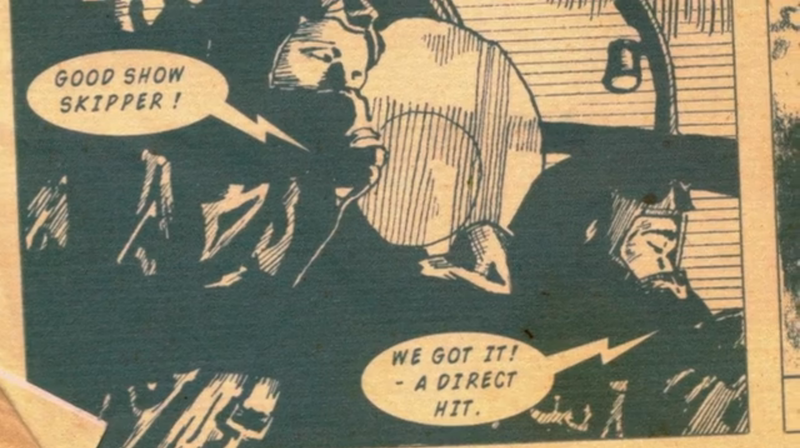 Bland presents a particularly beautiful archive description of a raid that took place through a wall of searchlights. This stimulated a distinctively pleasing scene that is almost abstract in its formal arrangement barring the silhouette of the plane. 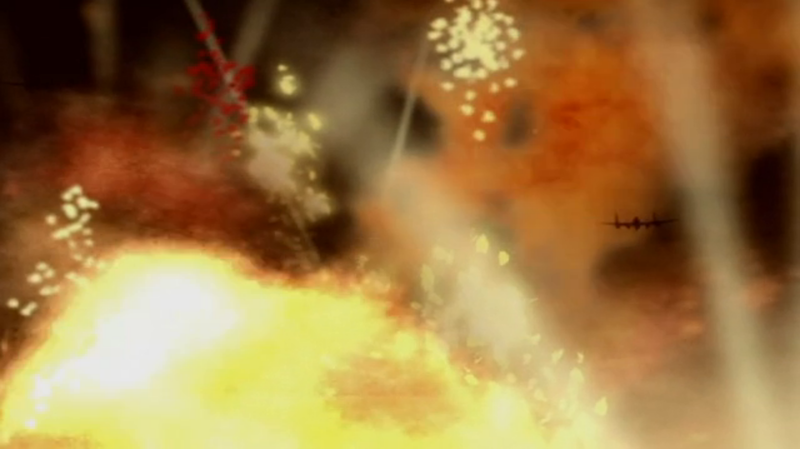 In another scene that is set to the visuals of a comic scrip, an American pilot gives an account of an effective raid over Berlin, which is almost flippant. His account is detached entirely from the deadly result of the mission, instead he includes phrases like; “I could see the bombs going down very nicely… I enjoyed it very much”. This film does not address the more contentious nature of the task these pilots were charged with. Essentially they were enforcing the British equivalent of the Blitz, dropping bombs that would inevitably cause civilian casualties. I was left speculating whether this issue was not dealt with because it was not a problem for the airmen interviewed. They may have felt it was their duty and possibly even a fair one in the context of war. However I also wondered if the filmmaker’s nostalgia for the subject matter pushed the narrative away from such controversy. Bland explains in concluding titles that the film is dedicated to his Grandfather along with the other men from the Bomber Command killed in the Second World War. An additional puzzling note states that none of the airmen set with this duty were ever commemorated with a medal for their bravery. This film manages to capture effectively the naïve feeling of excitement at the beginning of the war, a sense of camaraderie felt between the airmen along with the drama and the formal beauty found in such destruction. The film addresses the tragedy associated with loss of life in the Bomber Command whilst maintaining a traditional lack of emotion associated with the British spirit’s stiff upper lip. As the narrative was constructed from half a dozen different accounts a sort of cross chattering effect distracts from an otherwise clear narrative. This is however an acceptable side effect when collating such a multitude of sources. 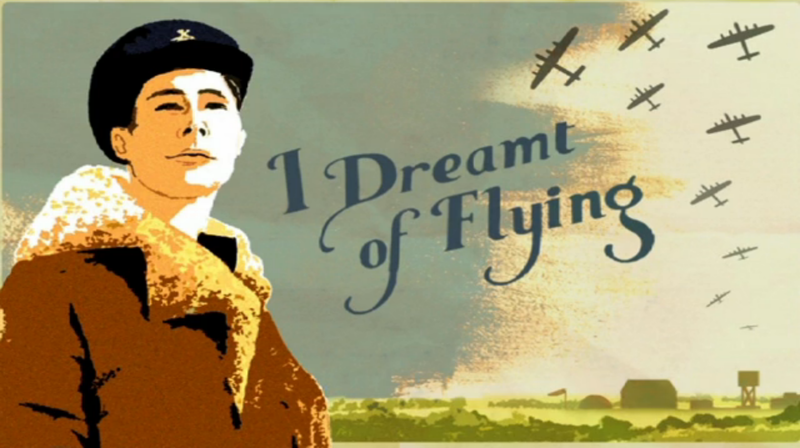 ‘I Dreamt of Flying’ has collected an award from the Imperial War Museum and received the staff pick from Vimeo. Animated Documentary found this film on the vimeo channel Doco-anim.